Says "Bob Bondurant drives FIA Cobra Roadster CSX 2345 to 1st in place in GT at the 1965 Rossfeld Hillclimb scoring points in the 1965 FIA International Championship for GT Manufacturers. 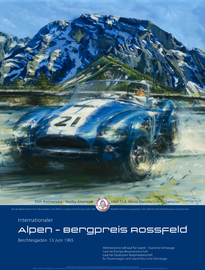 Internationaler Alpen-Bergpreis Rossfeld, Berchtesgaden 13 Juni 1965. The drawing us based on a painting by Klaus Wagger.